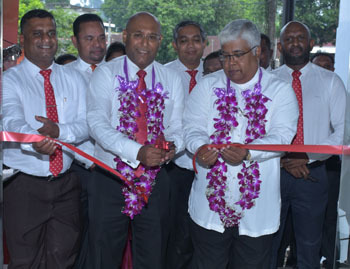 Pan Asia Bank ceremonially opened its Ratnapura branch at its new location on 15 November at 37, Bandaranayake Mawatha, Ratnapura. The Director/Chief Executive Officer of Pan Asia Bank Dimantha Seneviratne was the Chief Guest at the opening, and the Senior Management of the bank, members of the business community and customers in the area were among the other distinguished guests. Chamila Pothupitiya heads the Pan Asia Bank Ratnapura branch. The branch will be open from 9 a.m. to 6 p.m. on weekdays and from 9 a.m. to 1 p.m. on Saturdays.